Existing applications that allow the visualization of, and interaction with, geospatial simulations and their results generally present views of the data that restrict the user to a single perspective. When zoomed out, local trends and anomalies become suppressed and lost; when zoomed in, spatial awareness and comparison between regions become limited. The probe-based interaction model integrates coordinated visualizations within individual probe interfaces, which depict the local data in user-defined regions-of-interest. The technique has been incorporated into an agent based simulation, a census data exploration tool, a 3D GIS environment for analyzing urban change over time, and an interface for exploring historical and forecasted urban growth patterns from a complex urban growth simulation. In these applications, and in general, probe-based interaction enhances spatial awareness, improves inspection and comparison capabilities, expands the range of scopes, and facilitates collaboration among multiple users. The great freedom afforded to users in defining regions-of-interest can cause modifiable areal unit problems to effect the reliability of analyses without the user’s knowledge, leading to misleading results. However, by automatically alerting the user to these potential issues, and providing them tools to help adjust their selections, these unforeseen problems can be revealed, and even corrected. Thomas will also briefly cover his urban LIDAR change detection/exploration project. 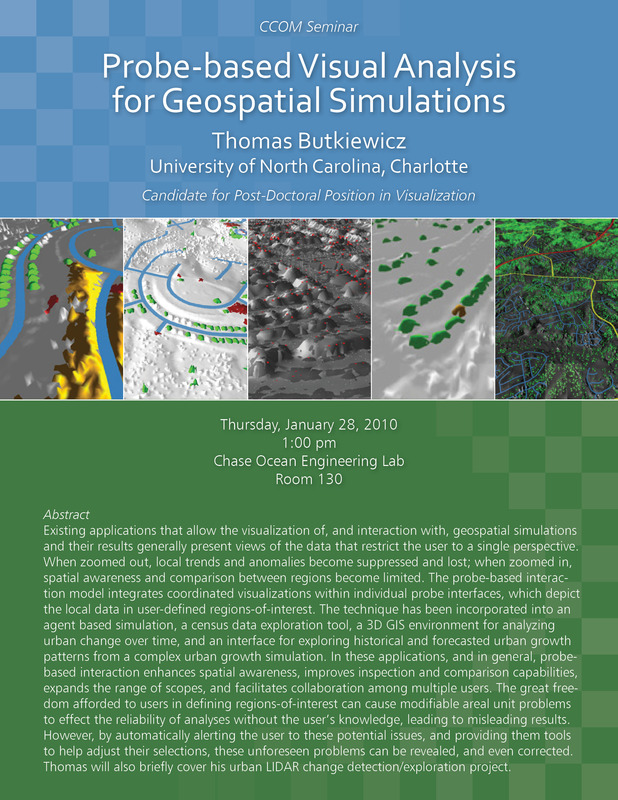 Before coming the CCOM/JHC, Thomas Butkiewicz was a research scientist in the Data Visualization Group at the Charlotte Visualization Center, and a Ph.D. candidate in computer science at UNC Charlotte. His primary research currently involves developing highly interactive geospatial visual analysis applications using my concept of a probe-based interface. His current project is a probe-based decision support system designed for a multi-touch table that allows users to freely investigate the results of a simulation of predicted urban growth in the Charlotte region in a natural, efficient, and engaging manner. He also maintains and expands upon his previous research projects involving change detection between annual urban and coastal LIDAR scans in an enhanced GIS environment, and incorporating error-awareness into terrain calculations such as model creation/extraction and line-of-sight. He is particularly interested geospatial data visualization and interactive maps, however his research interests also include information visualization, remote sensing, computer vision, image processing, virtual reality, and stereoscopic displays and rendering. Outside of the computer science field, his interests include physics, electronics, medieval architecture, motorcycling, and collecting, restoring, and playing pinball machines.